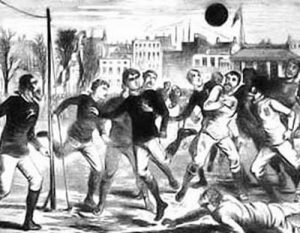 Football (and I refer to soccer) was a little slow getting hold in Northern Ireland, it was already becoming popular in England and Scotland. The FA was formed in 1863 some 15 years earlier, but within two years of this exhibition match, the IFA was formed (1880) with the Irish cup launched the following year (1881) Football was spreading fast and gathering momentum and it wasn’t long before Fivemiletown got the itch to play. 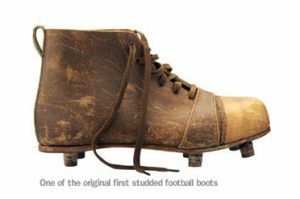 You must remember that football at this time was still in its infancy. There were only eleven players allowed, no substitutes, there was no such thing as penalties, there was a referee but there were two umpires, one from each team and they made the final decisions and could (and often did) overrule the referee, there was in fact only two posts stuck in the ground with some tape across the top as goals, there was no 10-yard rule and there was no league structure in these parts until 1904 so all matches at this point in time were friendlies. There are probably a few other differences but you get the picture, in the 1880s it was a bit rough and ready. Although there isn't a league set up at the moment which means there are no seasons as such I am still going to treat the first few years as seasons so that when the league actually gets up and running the pages will follow on from each other without any confusion. 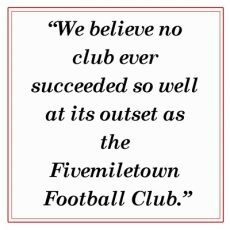 As I mentioned on my 'about' page football in Fivemiletown started in earnest around 1888 which is where I started my research, but after reading the first couple of articles concerning Fivemiletown I worked back into 1887 going back 6 months but I was unable to find any mention of Fivemiletown Football. There were, however, football being played in Fermanagh & Tyrone with Augher, Ballygawley and Enniskillen all being mentioned but unfortunately not Fivemiletown. There was a strong military presence, with Depots in Enniskillen, Omagh and Clones, and they were very keen on football in 1888 & 1889. The Kings Royal Rifles are mentioned several times playing friendlies against the likes of Clones & Enniskillen. Other teams who were mentioned include Augher, Clogher, Tempo, Omagh Athletic, Colebrooke, and Ballygawley. Association football is really taking off in this part of the country.